*I couldn’t make this statement without doing a little research to back up my claims, and I feel like I need to give the disclaimer that bananas are best eaten fresh for maximum nutrition (but you probably already knew that). While heat doesn’t change the levels of potassium (and minerals in general), it will degrade other nutrients (like vitamins) that bananas offer. Also, don’t boil your bananas. They’re chock full of rich chocolatey flavor. Cocoa powder and chopped dark chocolate tip these muffins dangerously towards dessert territory, which is just the way I like my muffins. There’s just enough sugar added to take off the bitter edge of chocolate, while not turning the muffins saccharine. To top off the perfection that is these muffins, the mashed bananas make it so only a couple tablespoons of oil are needed for the softest and most tender muffins you ever did meet. So, what are you waiting for? A couple of bowls, 12 ingredients, and mayyybe 35 minutes of your time are all that’s needed for you to meet the chocolatey banana treats of your dreams. Omar doesn’t like bananas. Actually that language is too mild, he pretty much abhors them. When we first started dating bananas were a regular part of my diet, usually eaten fresh as a snack. But as our relationship got more serious and we started eating together all the time (ok that was like basically week 1… we were best friends before we started dating, so things moved quickly), I noticed I was eating less bananas, which is just silly. Wanting to change his opinion on the fruit, I started baking with them more. I quickly discovered winning recipes included chocolate or strong fruity flavors (the banana-berry scones in Isa Does It are one of his favorite treats). While I still enjoy a good old banana bread (ideally with nuts! ), if I want his help eating my baked goods, I better doctor them up. Luckily, I love chocolate too. 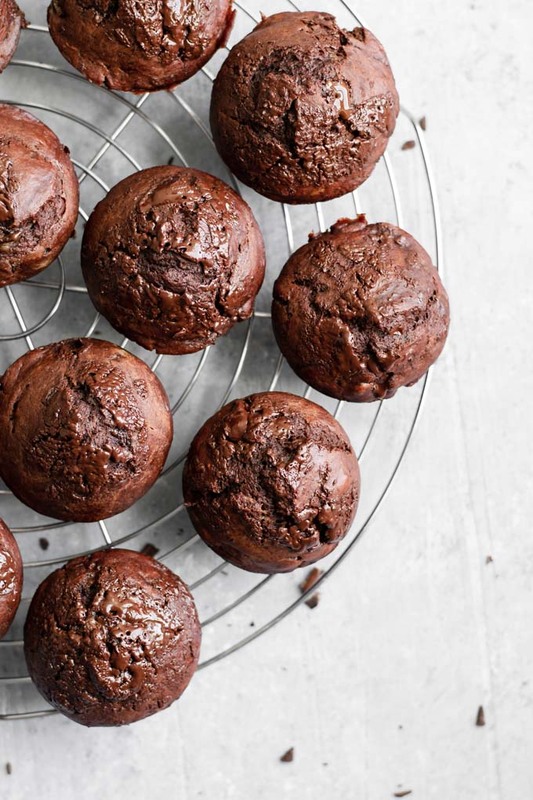 To amp up the chocolate-factor of these muffins I take the extra step of blooming the cocoa powder in boiling hot water. Blooming cocoa powder intensifies the flavor, releasing some of those delicious chocolate flavor molecules. This is a nifty trick for the chocolate lovers out there, and perfect for use in cakes. All you do is mix the cocoa powder in the hot water until it dissolves and forms a paste, then let it sit for a few minutes before adding it to the rest of your ingredients. To double up on chocolate, nothing but the richest dark chocolate should be used. Semisweet chocolate chips aren’t much more than 35% cocoa (which is the minimum requirement by the FDA), and most chips when tested by Cook’s Illustrated were in the 42-47% range. The remaining ≥53% of the composition is basically just sugar. Don’t get me wrong, I like chocolate chips. They’re tasty and sweet and still taste like chocolate. You can use them if you’d like! But, for the chocolate lovers out there, take the extra minute to chop up some dark chocolate. Starting at 60% dark (I used 70% dark), that’s a lot more cocoa than chips will have. 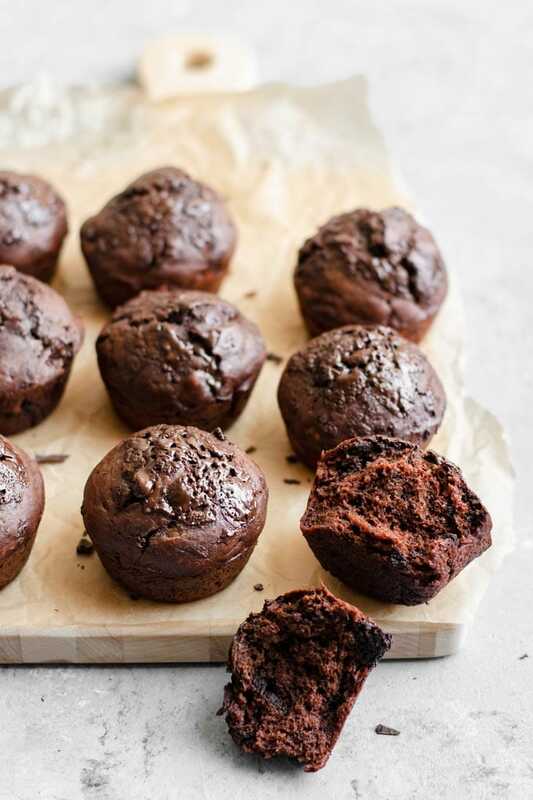 Chopped bars of chocolate will melt in the hot oven thanks to their higher perfect of cocoa butter, and the uneven nature of chopping means you’ll get a lovely mixture of larger chunks to bite into and small shavings that practically dissolve into the muffins. I like reserving a little of the chocolate shavings for sprinkling over the batter just before baking. I think it’s extra lovely that way, don’t you? 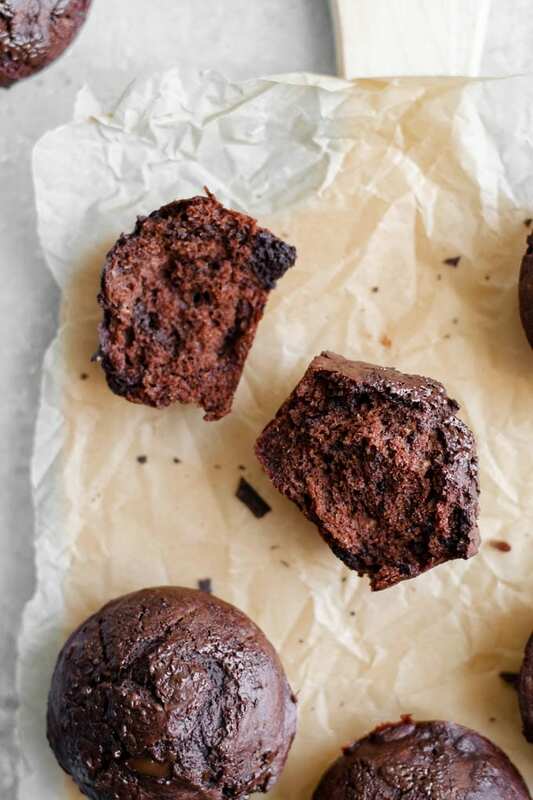 These muffins not only whip up in no time, they also freeze super well. I whipped up then froze a double batch right before our recent trip to London, which meant lots and lots of muffins on our return. 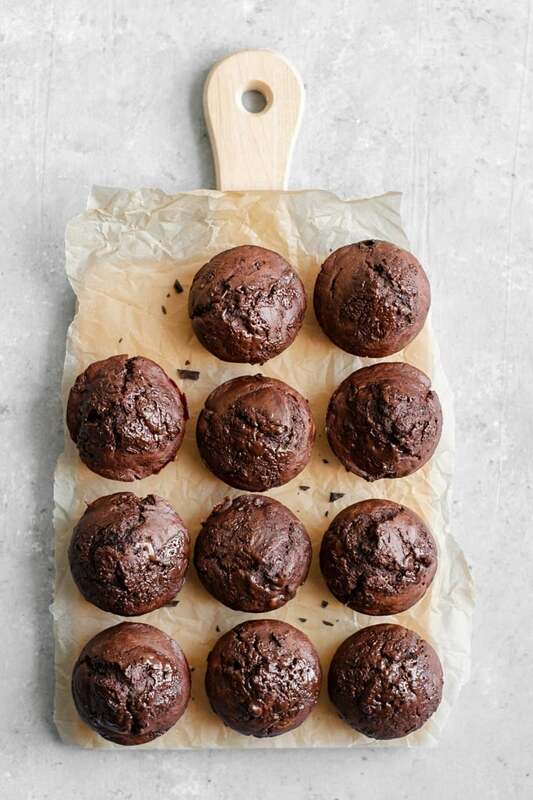 Taking out a few at a time means fresh tasting soft chocolatey muffins all the time! Defrost at room temperature in a ziplock bag or a sealed container. You can always zap leftover muffins in the microwave briefly to give them a hot out of the oven, complete with melty chocolate feel. I hope you guys try these muffins! With bananas and a lot of rich chocolate, they’re practically a health food. Ok, probably not a health food, but you can certainly feel less guilty about indulging in them! 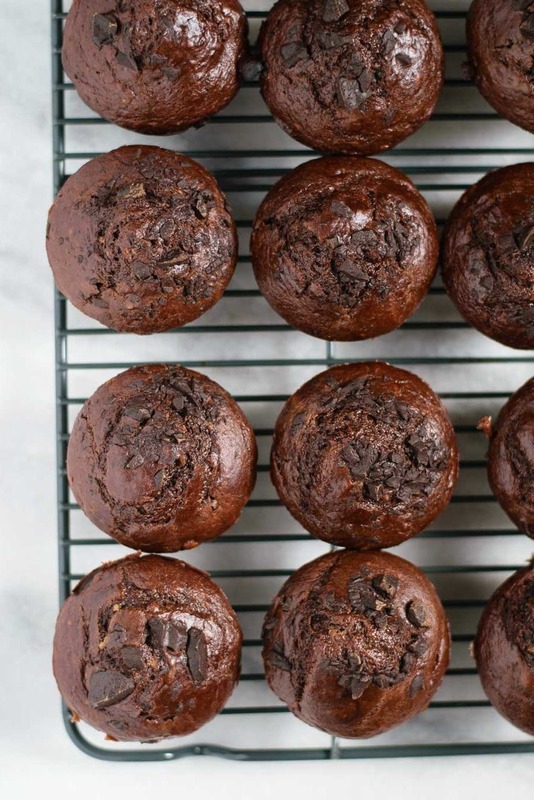 These muffins are a go-to when I find myself behind on eating bananas. They bake up so tall and tender, I mean, don’t take my word for it, just look at that crumb! 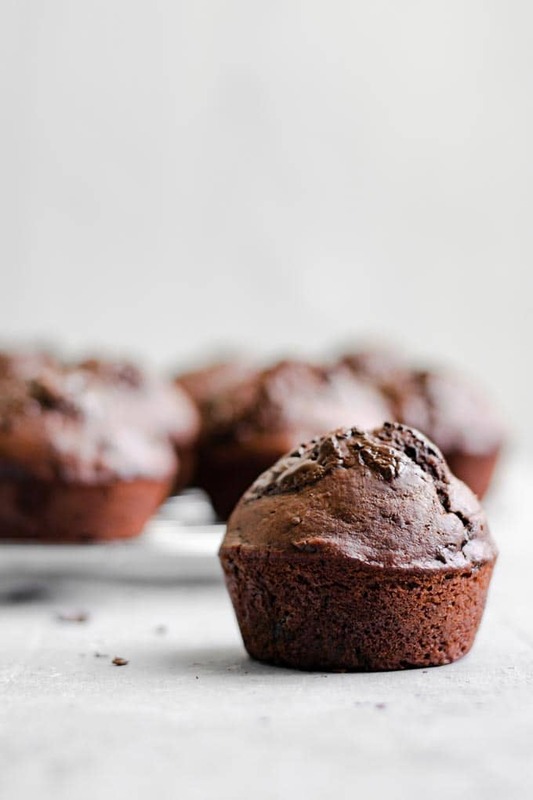 I’m such a fan of this recipe and these chocolatey muffins that I updated the old post with new photos for a bit of a refresh. Because it’s always kind of fun (read: cringe-y) to see, here’s an original photo below. It’s interesting to see the difference between the brands of chocolate I used last time around and this time. While the tops are still shiny (and yours are too, just hold them up next to a window to see–it’s all about the light! ), this time you can see my chocolate on top of the muffins melted a bit more. This is an interesting study on the differences between brands of chocolate! While I still used 70% dark chocolate, I’m guessing the new brand has a higher ratio of cocoa butter to cocoa solids, so that they melted more in the oven. Because, while 70% chocolate always means that 70% of the bar is made of chocolate (the rest usually being mostly sugar, followed by vanilla and/or any emulsifier used), that includes cocoa butter and cocoa solids and the ratio of the two varies by brand! And this may be partly why you find yourself appreciating one brand of chocolate over another. But I digress as this has nothing to do with chocolatey muffins! So, anyway.. If you make these vegan double chocolate banana muffins, leave a comment below and rate the recipe on the recipe card. And please share your photos with me on Instagram, tag @thecuriouschickpea and #thecuriouschickpea, I love seeing your creations! Happy baking! Use the ripest possible bananas for making banana bread for best results. Are they black all over? Perfect! You can always peel and then freeze ripe bananas if you don’t have enough ripen at one time or aren’t ready to bake. Just defrost completely before using. The extra chopped chocolate is not needed but delicious and highly recommended for the chocolate lovers out there! 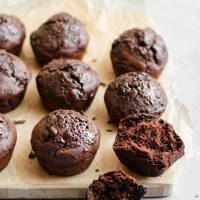 These delicious banana muffins have a double dose of chocolate, and are quick and easy to whip up! They can be disguised as a slightly indulgent breakfast, or enjoyed as a relatively guilt-free dessert. Preheat the oven to 375 ºF. Prepare a muffin pan by coating with spray oil, or with liners. Mix the boiling water and cocoa powder together in a bowl to form a smooth paste. In a mixing bowl, mash the bananas until they form a smooth paste. 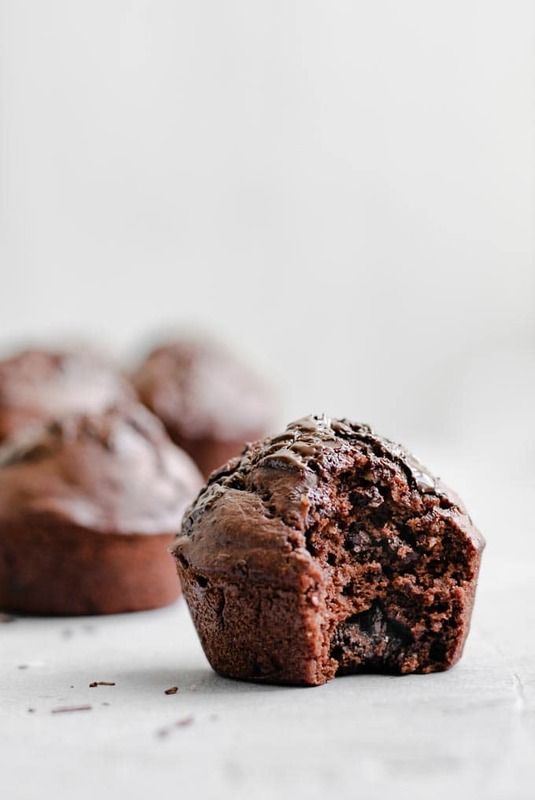 If they aren't overripe and remain a little chunky you might want to consider using an immersion blender to blend the bananas to a silky smooth texture, otherwise you may end up with some light colored banana chunks in the final dark chocolatey muffins. As long as the bananas are ripe, this is only a visual problem, so blending is optional. Add the sugar, plant milk, oil, and vanilla extract to the mashed bananas and whisk until smooth. In a second large mixing bowl whisk the flour, baking powder, baking soda, and salt to combine. When the oven is preheated, add the wet banana mixture to the dry ingredients and mix with a fork or wooden spoon until the mixture is mostly mixed together but lumpy with some dry spots. Add the cocoa paste and mix until combined and batter is relatively smooth. Fold in most of the chopped chocolate, reserving some to sprinkle on top of the batter. 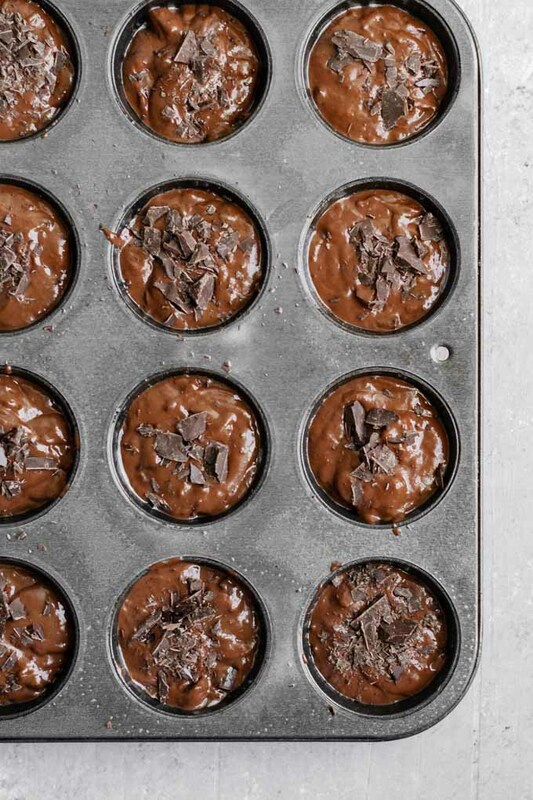 Fill the prepared muffin tins 2/3 of the way full, then sprinkle the reserved chopped chocolate over each muffin. Bake on the center rack of the oven for 18-20 minutes or until the muffins have pulled away from the edge of the tin (if not using a liner). You can also test with a toothpick or a cake tester, but the chocolate chunks in the batter will make it hard to tell if it's done. A tester might pull out with some melted chocolate on it, but no wet batter and only a few crumbs should cling to it when done. Let the muffins cool in the pan for 5 minutes, then pop them out and transfer to a wire rack to cool completely. Calories are estimated by Nutritionix. Woah! I made these tonight and they are amazing ! SO fluffy and spongy! And they taste so good ! It reminds me of a chocobanana pop in muffin form. Thanks for this recipe, it’s most definitely a keeper! Hi Kerry! It doesn’t matter too much which vegan milk you use. For coconut milk, I’d suggest either the coconut beverage in the carton or thinning canned coconut milk with some water so it’s not too heavy. I’d probably try ~2 of tablespoons canned coconut milk and the rest water. Hi Eva, thank you for such a lovely recipe. I made the double chocolate banana muffins earlier today, and they turned out absolutely divine. SO yummy! Made these tonight and had 2.5 of them. Used 3 bananas and it turned out great!